A lot of times, when purchasing gold bullion, buying in bulk makes significantly more sense than purchasing smaller quantities. Obviously, there are a multitude of occasions where financial situations do not permit a bulk order, but if the money is available it is suggested. If you have ever bought anything online, you are well aware of the fact that shipping can add up and be a real killer on your bottom line. This is especially true when purchasing gold bullion. The reason is because shipping is priced by weight, and since gold is metal and obviously weighs more than something like clothing or a DVD, the costs can be extraordinary. Luckily, there are ways for you to avoid such high shipping costs, all of which will be discussed in the following few sections. Having gold and silver shipped to you can be an expensive endeavor, and precious metals dealers know this. They look to help themselves while helping you by offering free shipping if you buy a certain amount of gold or simply spend a certain dollar amount. For example, you can earn free shipping on all orders that exceed $8,000. In this hypothetical example, all you have to do is spend at least $8,000 and you will not have to pay shipping costs. Spending $8,000 on one order may seem like quite a lot, and I would be lying if I said it wasn’t, but in all reality it does not take much purchasing to reach that point. If you think about it, making one bulk purchase of $8,000 and receiving free shipping is much better and cheaper than spending a total of $8,000 on many separate orders. If you choose to go about purchasing bullion in piecemeal fashion, you will quickly realize that the $20 and $30 shipping costs add up fast. Always check with the site you wish to purchase from before assuming you will get free shipping. Most online dealers work differently so the amount of money that warrants free shipping on one site will likely not be the same on another site. JM Bullion, for example, offers free shipping on all orders over $100. Even if shipping costs do not concern you, there is another facet of bullion purchasing that makes bulk purchases more sensible if your finances allow it. Whenever you buy gold, you are typically going to be paying a price that is already over the market value of the metal in your bullion due to what is called a premium. Every gold, silver, or platinum purchase carries a premium and in some cases the premium can increase the bottom line you pay by a large amount. After paying a premium, many unsuspecting buyers are even more disheartened to find out that shipping costs add up just as quickly. Buying in bulk makes sense because not only will you have a good chance of receiving free shipping on your order, but as the price and size of gold you buy rises, the premium drops as well. Deductions in the prices of premium and shipping are precious metals dealers attempts to both make you buy larger amounts for less money, but also to clear their shelves at a faster rate. 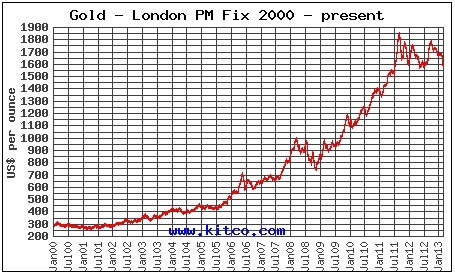 At the end of the day, bulk purchases of gold bullion tend to benefit everyone involved.